A few selections (Corelli Christmas Concert, Benedictus, and Fantasy on Coventry Carol) from the December 6, 2015 Christmas Remembrances Concert are now available for viewing on our video page. We have a rehearsal at 7PM this Sunday evening (February 21) following the L.A. Winds concert at Pierce College. If you are interested in attending this concert, tickets are available at the door to the Performing Arts Building (to the right of the band room). There are 2 performances, 1 and 4PM. Attendees will have the opportunity to hear Chuck playing his fabulous bassoon, along with supporting your fellow SOA flutists’ Joanne Wallace, Randy Weinstein, Debby MacMurray, Suzanne Duffy, and Sue Anderson. Hope to see you there! The next Song of the Angels Flute Orchestra concert, SPRING SENSATION, is at the San Diego Spring Flute Festival, April 19th at 11 a.m. at San Diego State University School of Music and Dance, located at 5550 Campanile Dr., San Diego 92182. Please click here for parking information. The concert will also feature Gluck’s Dance of the Blessed Spirits with Special Flute Soloist, Jean Ferrandis, Mussorgsky’s Night on Bald Mountain and close with J. S. Bach’s Air on a G String as the Finale open to all Festival flutists. French flute soloist and conductor Jean Ferrandis enjoys an international career that takes him throughout Europe, Asia, and North America. Leonard Bernstein was so impressed by his 1987 performance of the adagio from Mozart’s D major concerto that he remarked “It is Pan himself!” and subsequently composed a cadenza for Mr. Ferrandis. He has presented recitals, performed chamber music, and appeared as soloist with orchestras in the most prestigious concert halls in the world under such conductors as Leonard Bernstein, Tibor Varga, Laurent Petitgirard, and Yoram David. His appearances at the 2006 National Flute Association convention in Pittsburgh, an event attended by three thousand flutists, included a gala headliner concert in Heinz Hall and a master class. Jean Ferrandis unanimously received his first prize from the Lyon Conservatoire, where he studied with Maxence Larrieu. A prize winner at such as international competitions as Munich, Barcelona, and The Young Concert Artists in New York, he was awarded the grand prize at the 1986 Prague Spring Festival International Flute Competition. Admission to the concert is $20/person for SDFG members and $30/person for non-members. Parking is $3 for SDFG guests, and must be purchased by April 1st or the rate is $15 at the door. To view excerpts from previous Song of the Angels Flute Orchestra concerts, go to www.soafluteorchestra.com/videos/. For details on the concert, contact Frederick Staff, Founder and Artistic Director of the Song of the Angels Flute Orchestra at 323.823.1078. Conductor Charles Fernandez will lead the group in a variety of works including J.S. Bach’s Brandenburg Concerto #4, Ralph Vaughn Williams’ Greensleeves, Saint-Saens’ Danse Macabre and Ernst Bloch’s Prayer from a Jewish Life with David Shostac performing solo flute. Mr. Fernandez is a well-known and established composer and orchestrator for film, television and the concert hall, including Disney, MGM and Artisan films plus several Disney television series. Mr. Fernandez will also be conducting his original work, Elegy for Oboe. It is the 2nd movement of Mr. Fernandez¹s Oboe Concerto, dedicated to the memory of his father with solo performance by Lisa Febre, oboist and member of the Song of the Angels Flute Orchestra. Lisa is a graduate of Ithaca College and holds a Bachelor of Music degree in Oboe Performance. She has played on several movie and television scores, in particular, the hit TV series “Smallville.” The concert will conclude with Mussorgsky’s Night on Bald Mountain. Free-will donations for the concert are gratefully accepted. Video excerpts of Song of the Angels Flute Orchestra concerts can be viewed at www.soafluteorchestra.com/videos/. For details on the concert, please contact Frederick Staff, Founder and Artistic Director of the Song of the Angels Flute Orchestra at 323.823.1078. 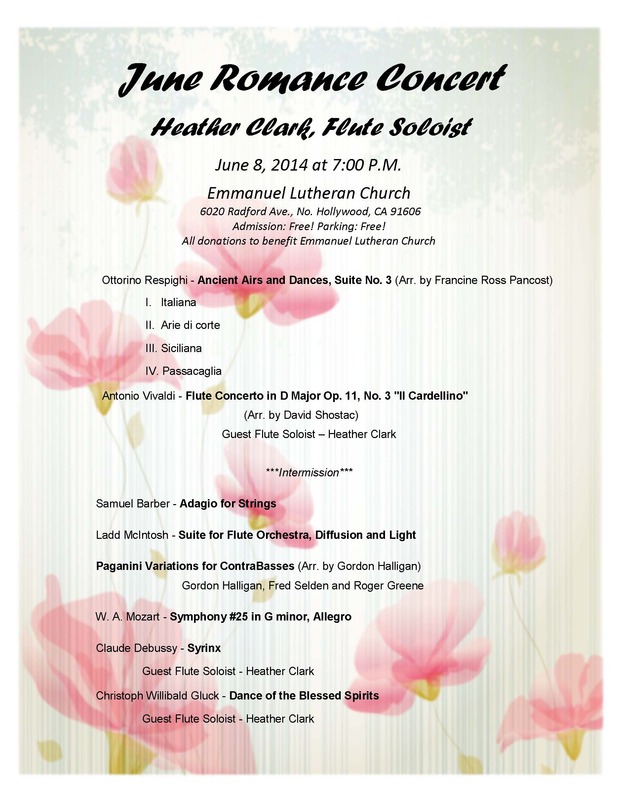 The next Song of the Angels Flute Orchestra concert in Los Angeles, JUNE ROMANCE, will be held on Sunday, June 8th at 7:00 p.m. at Emmanuel Lutheran Church, 6020 Radford Ave. (Corner of Oxnard and Radford,) No. Hollywood, CA 91606 (Phone: 818-761-6124) (Click MapQuest for directions; parking at the church is Free!) The concert will feature well-known LA flutist Heather Clark as guest flute soloist and a new composition by Ladd McIntosh. Suite for Flute Orchestra – Diffusion and Light was written by Mr. McIntosh expressly for the Song of the Angels Flute Orchestra and will be conducted by the composer himself. Ladd McIntosh is the lead orchestrator for Harry Gregson-Williams and has worked on 125 films as an orchestrator. Heather Clark is the Principal Flute of the Los Angeles Music Center Opera, the Hollywood Bowl Orchestra (2003) and the Long Beach Symphony Orchestra (1995.) Ms. Clark will perform as featured flutist in the Vivaldi Flute Concerto in D Major Op. 11, No. 3 “Il Cardellino”, Debussy’s Syrinx and Gluck’s Dance of the Blessed Spirits with the Song of the Angels Flute Orchestra. An alumnus of USC, she was awarded First Prize at the National Flute Association Young Artist Competition in 1994. Ms. Clark is one of LA’s most sought-after flutists and can be heard on over 100 motion picture soundtracks including “Rio,” “War Horse,” “Tin Tin,” and “Men in Black 3” and with a variety of recording artists including Barbra Streisand, Josh Groban, Flea, and Carrie Underwood. Admission is FREE with all donations received going to the Emmanuel Lutheran Church who hosts this concert and provides rehearsal space for the orchestra year-round gratis! To view excerpts from previous Song of the Angels Flute Orchestra concerts go to www.soafluteorchestra.com/videos/. For details on the concert, please contact Frederick Staff, Founder and Artistic Director of the Song of the Angels Flute Orchestra at 323.687.8747. Marymount California University presents the debut performance of the Flauti Virtuosi di Los Angeles on Sunday, April 13, 2014 at 4:30 p.m., in a combined program with Song of the Angels Flute Orchestra at the Marymount California University Chapel, 30800 Palos Verdes Drive E. in Ranchos Palos Verdes, 90275. 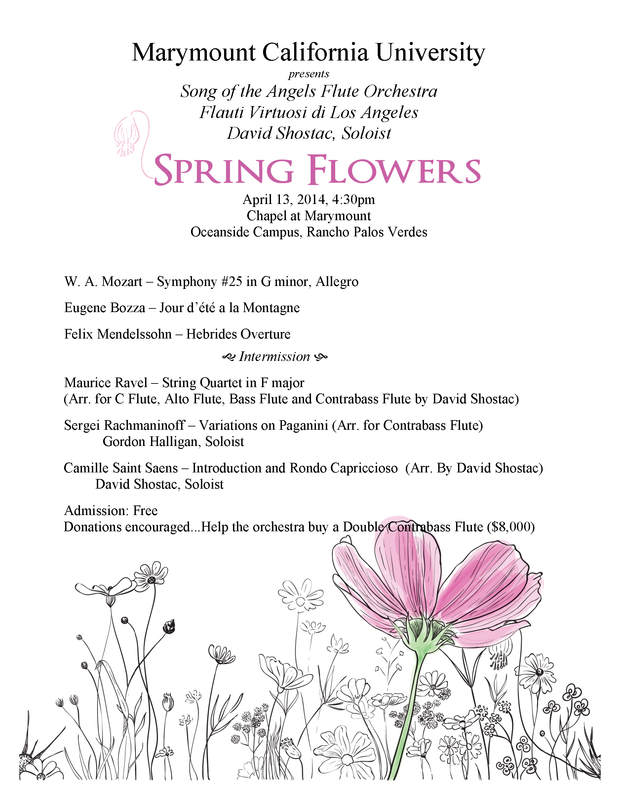 (Check http://www.marymountcalifornia.edu for directions/parking under “Maps and Transportation.”) This Spring Flowers combined concert will also mark the debut appearance of Charles Fernandez, recently appointed conductor of the orchestra. Mr. Fernandez is a well-known and established composer and orchestrator for film, television, and the concert hall, including Disney, MGM and Artisan films plus several Disney television series. Flauti Virtuosi will perform the Bozza Jour d’ete a la Montagne and the Ravel String Quartet in F major arranged for four flutes by David Shostac. The new group is led by Mr. Shostac, Artist in Residence at the Song of the Angels Flute Orchestra, with Frederick Staff, Founder and Artistic Director of both organizations, Alto Flute, Francine Pancost, Bass Flute and Gordon Halligan, Contrabass Flute. Admission is FREE although all donations are gratefully received! These will help fund a double contrabass flute ($8,000) for the orchestra! To view excerpts from previous Song of the Angels Flute Orchestra concerts go to www.soafluteorchestra.com/videos/. For details on the concert, please contact Frederick Staff, Founder and Artistic Director of the Song of the Angels Flute Orchestra at 323.687.8747. Join the Song of the Angels Flute Orchestra, conducted by Michael Armstrong, at their first concert of the New Year on Sunday February 23, 2014 at 4:30pm, St. James’ in the City at 3903 Wilshire Blvd., Los Angeles. This winter’s concert will premiere a composition by Ladd McIntosh, Suite for Flute Orchestra, written specifically for the Song of the Angels Flute Orchestra and conducted by the composer himself. Ladd McIntosh, the lead orchestrator for Harry Gregson-Williams, has worked on 125 films as an orchestrator. Featured on this winter concert will be David Shostac, Principal Flute of the Los Angeles Chamber Orchestra and acclaimed movie recording artist. Shostac will dazzle you with his performance of Saint-Saens’ “Introduction and Rondo Capriccioso” (originally for violin) and will also be presenting his arrangements of some other very exciting pieces. In addition to the presentations with the featured soloists the Song of the Angels Orchestra will also be performing Mendelssohn’s Hebrides Overture and Vaughn Williams’ Fantasy on a Theme by Thomas Tallis. We look forward to seeing you at the concert! Recommended donation for a concert ticket is $20 (Students: $15).